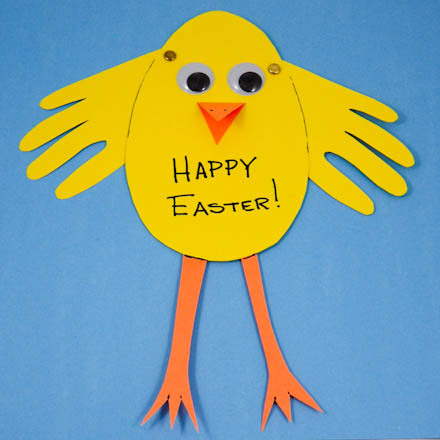 See how easy it is to make an Easter card by tracing your child's hands. This is a fun project for kids of all ages. Even toddlers will enjoy this project, since cutouts of their traced hands are used for the wings. Relatives will enjoy receiving this card as a keepsake that reminds them of those little hands. This project is great for family, classroom or group craft time. 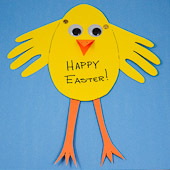 Related craft: For more Easter card fun, see the Fun Shaped Cards project. Read through the project, then gather the materials needed for making your chick card. 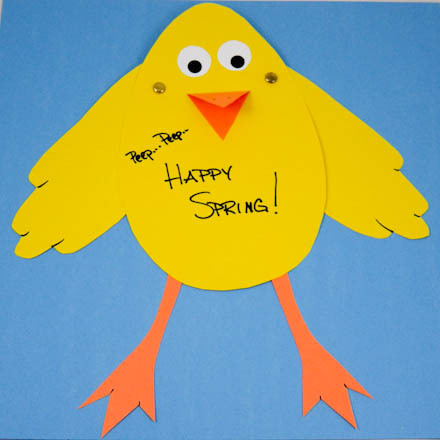 When doing this craft with a group, pre-cut pieces of yellow and orange construction paper. A 9" by 12" piece of yellow construction paper cut in half (two 6" by 9" pieces) and a 6" by 4½" (quarter of 9" by 12" sheet) piece of orange construction paper work well for smaller children. 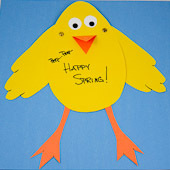 Trace your child's hands on the yellow paper; these outlines will serve as the chick’s wings. The hands can be traced with the fingers spread or held together. Cut out the traced hands. Write the child’s name and age on the back of the wings. Trace an oval or egg shape on the yellow paper. Make it about a fourth to a third larger than your child’s hands, so that the egg is in scale with the wings. Cut out the egg. 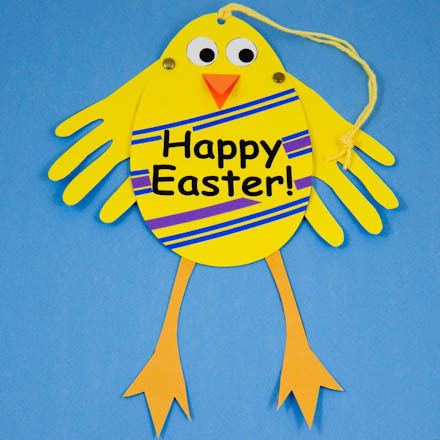 Attach the wings to the back of the egg cutout with paper fasteners. The paper fasteners allow the wings to move. For fixed wings, glue the wings to the egg. Cut a beak and legs from the orange paper. Cut a diamond shape for the beak and fold it in half. Make the legs long and thin with three pointy toes. Glue the bottom half of the beak to the egg, and glue two wiggly eyes above it. Glue the legs to the back of the egg. Tip: If you don’t have wiggly eyes on hand, either cut and glue eyes made of paper or draw eyes directly on the egg shape. Write a message on the front of the egg. It's fun to hang the card. Punch a hole in the top of the egg and insert a loop of yarn to make a hanger. 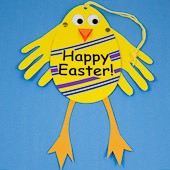 Tip: You could also color the egg in a fanciful way or decorate the egg with paper strips or punches. You could also give the chick some fluffy down—just pull bits of fuzz from cotton balls, glue them on the egg and color them with a yellow marker. Let your imagination run wild! That's it! Your chick card is done! Tip: Trace around fingers held together for a more wing-like look. Tip: Decorate the card with paper stripes and add a hanger to the top. Thanks to Tricia Wilson for sharing this craft idea with Aunt Annie's Craft Exchange back in 1996. Tricia commented, "The crafts I enjoy are simple kids' crafts. These seem to be on my level! We enjoy making handmade cards and gifts to send to relatives."